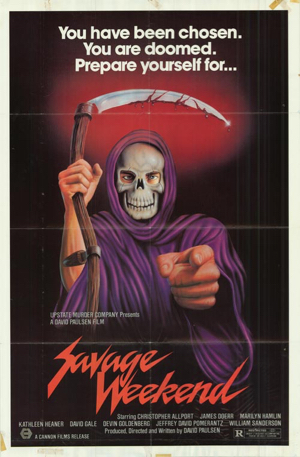 Filmed in 1976 but not released until 1979, Savage Weekend is the story of a brave boom mic that takes a trip to upstate New York for the weekend and ends up witnessing a lot of decadent behavior and, eventually, a few gruesome murders. Sadly, the brave little boom mic apparently has no social skills because everyone pretends like they don’t see it, even though it shows up a few dozen times, always floating at the top of the screen. It’s also the story of Otis (William Sanderson), a local redneck (I’ve never been to upstate New York but I still find it amusing how movies always portray it as being a step away fromDeliverance country) who spends his time talking to his father’s gravestone. Apparently, when Otis was younger, he found out his girlfriend was cheating on him so he branded her with an H. Why an H? Because, we’re told, Otis doesn’t know how to spell whore. Actually, if you’ve watched any number of these type of films, you’ll immediately recognize William Sanderson. Sanderson played a countless number of backwoods weirdos and he always did a pretty good job. (He also played the poignantly sympathetic J.F. Sebastian inBlade Runner.) Interestingly enough, in real life, Sanderson has a law degree. Savage Weekend, incidentally, has a brilliant opening. After running through the woods, a woman finds herself cornered by Otis. As Otis approaches her, he gives her a strange little half-smile. It’s super creepy and scary and the rest of the film never lives up to it. That said, Savage Weekend is an interesting film, even if it’s not a particularly good one. I’m not sure if it’s intentional or if it’s a happy byproduct of the filmmaker’s general incompetence but Savage Weekend has a truly surreal feel to it. It moves at a deliberate, almost dream-like pace. Characters appear and then vanish for lengthy periods of time. Plot points are raised and then abandoned. As a result of an inconsistent script, much is hinted at without ever being truly revealed. It makes for a very odd viewing experience. Since the first murder doesn’t take place until an hour into the film, we spend more time than usual getting to know our victims but none of them behave in any sort of consistent manner, which adds to the film’s dreamlike feel. Nicky clutches a barbed wire fence while watching Shirley fool around with Jay. Marie appears to be on the verge of ecstasy while listening to the story about Otis branding his girlfriend. Later, a good deal of screen time is devoted to Marie and another redneck milking a cow, with the camera zooming in on the milk shooting out of the udders. While being stalked by the killer, Nicky puts on makeup while a lingerie-clad Shirley dances through the house while tango music plays on the soundtrack. It all just feels very odd and strangely paced, as if huge chunks of the script were either not filmed or left on the editing room floor. But that oddness (along with the boom mic) is exactly what makes Savage Weekend an interesting movie.